Slip and fall accidents are one of the most common causes of injury nationwide, and can result in concussions and broken bones in just a few seconds. While it may be easy to categorize these injuries as “accidents,” the truth is that many of them may have been avoided if the property owner had taken more care. A hose left over a sidewalk, a puddle gathering on a grocery store floor, and an icy patch in a public parking lot are all hazards that make for prime accident conditions—and all demonstrate negligence that place pedestrians at risk. 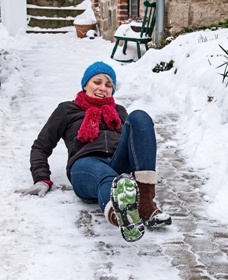 The potential for a slip, trip, or fall can happen almost anywhere. Whether you are going out to dinner, going for a jog, or having drinks in your neighbor’s backyard, a simple act of negligence by a property owner can force you to endure painful and costly medical treatment and weeks or months off work. Floor mats. Businesses will often lay non-slip floor mats by doors, under water fountains, and in well-trafficked areas. While these mats can be beneficial in preventing falls, they present their own hazards. A mat that has been overused can start to curl or peel at the edges, making a trip more likely. Mats that have been laid to soak up water or melted snow may become too saturated, posing a slipping hazard. Finally, mats that are not laid correctly may have wrinkles or shift out of position as many people walk over them, increasing the odds of someone catching the front of their foot as they enter. Workers. Companies rely on staff to keep their businesses running smoothly, and that involves a flurry of activity and many different moving parts. Customers are expected to navigate restaurants with swift waitstaff and grocery stores where employees are constantly restocking items and changing displays. The chances of a fall increase even further if a business remains open to the public during a remodel or renovation. Cables and cords. Extension cords, ropes, power cables, and other lines run across walking areas are essentially tripwires to passers-by. If it is necessary to run cords across walking surfaces, they should be taped down, covered with mats, and have clear signage warning of the danger. Water. Slips on spilled water or ice are leading causes of fall injuries, and there are nearly limitless ways water on a surface can lead to a fall. Outdoors, recessed pavement and potholes can collect puddles, downspouts can cause flooding across lawns and into businesses, and metal and wooden steps become slick after a few moments of rainfall. Indoors, customers can leave puddles from their jackets and umbrellas on rainy days, while pipes in restrooms and eating areas can cause puddles year-round. Loss of traction. Water isn’t the only substance that poses a slip hazard to pedestrians. Spilled liquids, especially ones containing fats (like milk) or grease (like engine oil), can cause a faster slip and harder fall. Other debris, such as fine dirt or sawdust can cause a sudden loss of traction, especially on a polished concrete or high-gloss wooden floor. Stairs. Stairs pose a particular danger of falls, since a tumble down a flight of stairs or over a railing can result in more serious injuries than a fall on one level. Steps must be constructed and evenly planed to prevent tripping, be free of clutter or debris, and should be in good condition with adequate tread. In addition, stairways used by the public should always have strong handrails and proper lighting. Uneven walking paths. Sidewalks, parking lots, and walkways should be clear, even, and dry. Uneven pavement, broken concrete, changing grades, high curbs, potholes, tree roots, and even landscape edging near walkways can cause trips, especially if these areas are not well-lit. If there are objects blocking a walking path, pedestrians may suffer falls or other injuries by attempting to walk around them. If you were injured on someone else’s property, we can investigate the circumstances of your accident to determine whether the owner was negligent. Our experienced injury attorneys will listen to your story and examine your case carefully to determine the best way to move forward. Contact our legal team today to schedule a free, no-obligation consultation. Do I Have To Go To Court For My Personal Injury Lawsuit? What amount should I sue for in my personal injury lawsuit?